I was pleased when asked to blog for Diavolo’s 25th anniversary event in part when I learned that this 11am to 11pm program was to be held at my alma mater, California State University, Northridge. And the 3pm performance “The Veterans Project 2017” was to be held in the most exquisite and perfectly scaled Soraya/Valley Performance Art Center, designed by the architect Kara Hill, then with HGA. I came with my friend CiCi and her son. They are new to this country and recently left China to start a new life here. So it seemed appropriate to introduce them to America on this Veteran’s Day tribute to the men and women who protect this country. During the day there were activities for kids to play on Diavolo’s equipment, albeit scaled down. The other reason I was eager to attend of course was to see this new work by Jacques Heim, Founder and Artistic Director for Diavolo. I’ve know Jacques for years, and was curious to see how this brilliant “architect of motion” as he refers to himself, would create a performance that would translate this nation’s Veteran’s Day celebration into a high art experience. In my mind I wondered if the path less traveled would transcend the expected patriotic and sentimental tribute. And for those of us who recoil at the current political climate, there is little if anything to celebrate. I was not disappointed, nor were the other 1,700 audience members in this filled to capacity theatre. Dressed in black Japanese warrior inspired costumes, each of the 16 performers stepped forward into the light to introduce themselves. To my surprise, it was “name, rank and serial number.” These were not Diavolo company members, but men and women who had served in the army, navy, marines, air force and coast guard, sharing where they served, when they served, and included the injuries they had sustained, both mental and physical. This performance event suddenly became very personal. After these introductions, the lights dimmed and opened to reveal the stage with a large circular movable platform with round openings for long aluminum and acrylic poles. This platform served as an arena for action, acting as either a home base or memorial, the poles were used as structural elements. Then at other times the performers moved the platform as if it were a battlewagon with the poles held by each performer and used as long weapons fending off intruders. This was architecture in motion as a visual metaphor for a homeland under attack played out. Dusty Alvarado, Institute Director, describes the set piece design as IBUKI, a Japanese word which means inner-strength, renewal, resilient enough to endure and emerge beautiful. So these vets endured a four month intensive workshop. These 16 people, none of whom had ever danced before, let alone performed on a stage, did indeed rise to the occasion. One veteran was later to say when asked during the O&A “how was it being up there” said, “it has its own kind of anxiety.” As a non-dancer taking dance classes since the 1970’s, I can relate! These are tough people, and they entered with bravery to encounter, share and reveal the best of who they are on the Diavolo stage. It was a tribute to the healing power of performance and the power of collective movement in a choreographic context. Perhaps a way to rewrite their own inner narratives. Indeed, several members said that this 16 week workshop was a major healing experience for them, with a few individuals reporting that it literally saved their lives. There was a second performance called D2R. 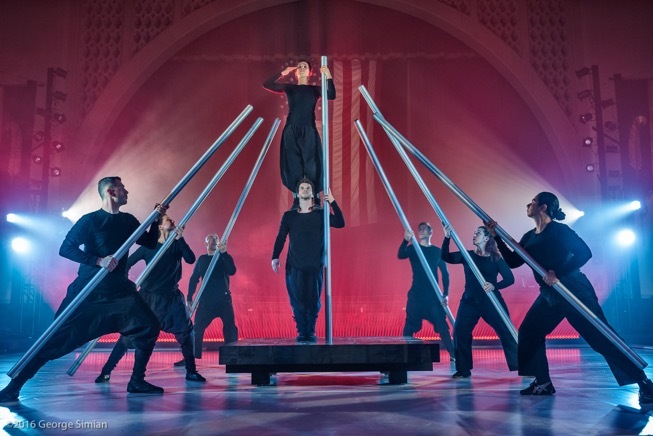 From the program notes, “Inspired by military culture and combat landscapes, D2R is an abstract representation of the determined yet agonized warrior in us all..” This second performance however, was performed by Diavolo’s company members. I honestly can say I didn’t know which group of people I was watching. The lines became blurred between the veterans and the company members. This was especially played out in the first piece in which 7 Diavolo performers joined the 16 veteran performers. And it didn’t seem to matter who was who. The level of performance was professional, robust and emotional. During the Q&A another remarkable thing happened. The veterans took questions, and to my surprise audience members stood up to say they were in the military also and shared their experiences. The gravity expressed from the stage found it’s way to audience as well. This experience unified the entire theatre that day. So this was not just my personal journey, but a collective performer to audience shared experience. It was elevating, uncomfortable and inspiring. A personal journey for all of us.